Based in the Netherlands illustrative designer Jan Willem Wennekes who works in graphics and animation is intimately known by his clients as Zeptonn. Today he brings us one of his latest creations in which he has taken the role of publisher on a publication titled Black and White Freedrawrings. A unique exploration of collaborative drawing. In the book, over 40 international artists collaborate on a drawing with Zeptonn.These workings are called “freedrawings” to highlight the lack of restrictions, themes and guidelines. 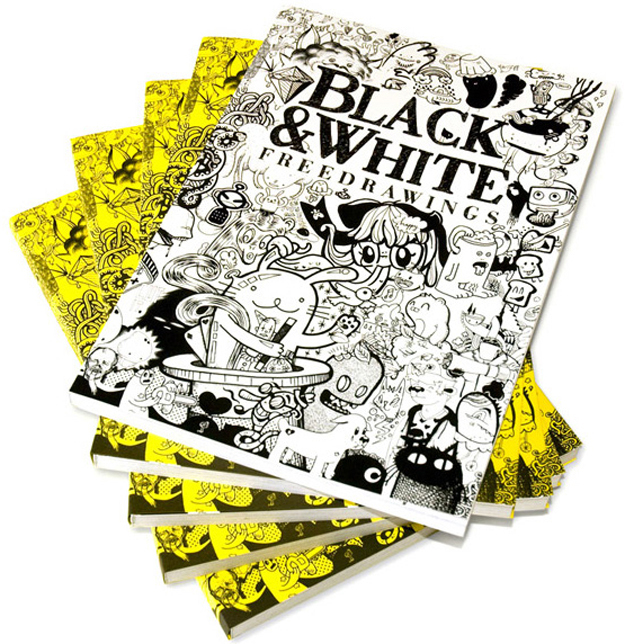 However this is not to be confused with a collection of doodles, all of these pieces are final collections of drawings In 132 pages filled with freedrawing collaborations the artists take you on a journey through the process of collaboration, showcasing their personal illustrations and working spaces. The book is produced in an eco-friendly manner, using a waterless printing process that reduces environmental impact. Computer-to-plate technology and silicon plates eliminate the use of chemicals and water. This is something that Zeptonn is both concerned and passionate about, and Im a strong believer that we need designers of this nature to help us move forward with ideas and products that we can use day to day, that are healthy to the planet while still providing the same function and use as the products that aren’t eco friendly. The first 10 copies of the book will come with limited edition gicleeprints with work from Sauerkids, Nick Deakin and Zeptonn, so worth getting in line quickly on this one i’d say.